Reference number for this case: Oct-54-La Feuillade. Thank you for including this reference number in any correspondence with me regarding this case. It was approximately eight hours of the morning and Mr. Julien L... went to his hen house located at the bottom of a meadow quite far from his farm. He entered the meadow and started to cross it in diagonal in order to circumvent the thicket which occupies a part of it. He was within about fifteen meters of the trees when suddenly, he saw a curious assembly of spheres emerging above them. The set affected the shape of one capital T letter, horizontal, the bar forwards, and it flew slowly at the level of the treetops, giving the impression that it intended to land. The bar of the T was made at least of three lines of nine spheres and it was followed of at least three lines of eight to ten spheres. Each sphere had a diameter of 30 to 40 cm and was separated from its neighbor by a space of 5 to 10 cm. All these balls were of a dull light gray, as wood ashes. And all HEAVILY rolled ones against the othres like balls rolling on a slope. The appearance was absolutely silent. The amazed witness turned himself towards the road in order to see whether there would not be by chance a providential cyclist able to confirm his amazing vision. The road was deserted. The witness looked again at the spheres that were at less than 10 meters of his head. But even before he could direct his eyes onto them, he was blinded by an intense luminous sensation BUT THERE HAD NOT BEEN THE LEAST EMISSION OF LIGHT. The dazzling had occurred in his eyes and he could not see anything anymore. "It was as if I had looked at the sun... I went to carry the grain to my hens but at least five minutes later, because at the beginning, I did not see anything at all anymore... I turned my eyes to all directions in vain, it was similar everywhere, I saw only large luminous stars which danced in front of me. Half an hour later, I still had luminous dots in the eyes... I never saw anything like that... And then when I returned from the hen house (to 150 m of the place of the incident and 1/2 hour later), I noticed above Bette a curious dark and low cloud, in the shape of a rhombus and which appeared solid. There was only this in the blue sky. That appeared odd to me but I do not know if it had any relation or not with the balls... And then it dissipated on the spot..."
We carried out an investigation on the premises, followed of a reconstitution of the facts. A geometrical study and complete mathematics of the description of the witness, estimates of size, speed and distance were carried out. All matched. It is absolutely not possible to doubt this testimony. Let's add that Mr. L... did practically not speak about it with anybody, not even to its wife who discovered with amazement this astonishing account at the same time than we did. It is by an extraordinary chance that the nephew of the witness, very vaguely aware of the affair, tipped us about his uncle. To conclude, let us specify that the witness did not suffer from any physiological or ocular disorder. The observation was of short duration, approximately three seconds, but it was made at very short distance. The Belgian skeptical ufologist indicates that a near landing case occurred at small French village called La Feuillade in the department of Dordogne, witnessed by J.L., a farmer who was in his late forties. Van Utrecht provides his translation of an interview conducted in 1972 by the now defunct French UFO group G.A.B.R.I.E.L., which has the witness state that it occurred in the year that everybody said they'd seen a 'flying saucer' in their backyard and one or two 'Martians' stepping out of it. The witness says all said they had seen a Martian but he saw something else. After a snip in the interview, it continues with the witness stating it was the time of the beetroots "(October 1954)", and that in the morning, at about 8 o'clock in La Feuillade he was going to feed grain to his chickens in a field on the other side of the road, with his corn sack under the arm, and he was midway down the pasture, halfway the thicket. All of a sudden, he saw lots of spheres, coming one after the other from above the thicket, big "like this (30 to 40 cm in diameter)", grey like ashes, and moving forward, one turning inside the other, looking like something heavy, and descending. The witness wonders how something that heavy [Interview is snipped again]. The witness told to himself this can't be happening, something with that weight, and expected it to land on the other side of the road. It came towards him, at no more than 10 meters from his head, not fast, a bit faster than a pedestrian, but slower than a bicycle (6 to 8 km/h). The witness was taken aback and amazed, he turned round towards the road to see if there was someone passing, to ask him to look how it was going to land, but there was nobody. He looked up again and he thought that at this moment "it must have spotted" him because he got blinded, and could not see anything anymore, nowhere, although he did see lots of stars dancing before his eyes. After a snip in the interview, the witness explains that he then could not see it again anywhere. He went to the chickens' house and when he got back 5 to 10 minutes later, he still had bright spots in front of his eyes. At that moment he saw a cloud in the direction of Bête. [Snip in the interview]. He said it was completely black and had a shape like a vertical diamond, with straight sharp edges; which was not normal. It began to swell and swell, getting bigger and brighter, there was only this cloud in the sky. After snips, the interviewed witness tells that the cloud was at 2 km in the northwest direction and the spheres went another way, west-southwest. 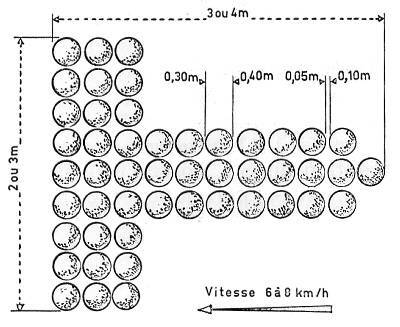 Van Utrecht indicates that the investigators asked several more questions about the aspect of the spheres and came up with the following description: a whole of about fifty dull spheres, grey like the ashes of wood, each with a diameter of 30 to 40 cm; they took the shape of a T-formation, with the horizontal crossbar first. In front there were at least three rows of spheres, each row measuring 2 to 3 m in length. Behind there were several bands with more spheres over a length of 3 to 4 m. and these spheres may have touched one another, or they were separated by a very small space of 5 to 10 cm. They all moved in the same direction, like marbles rolling down a slope, they were all where of the same size. The display was silent and lasted 2 to 3 seconds. The witness said the black diamond-shaped cloud was "close to the ground" and "dissipated at the spot". Van Utrech indicates that the sources are G.A.B.R.I.E.L., "Les Soucoupes Volantes: LE GRAND REFUS ? ", Michel Moutet Editeur, Régusse, 1978, pp. 226-231; D'Aigure, Jan, in "Pleins feux sur la Creuse" in Lumières Dans La Nuit, No. 131, January 1974. 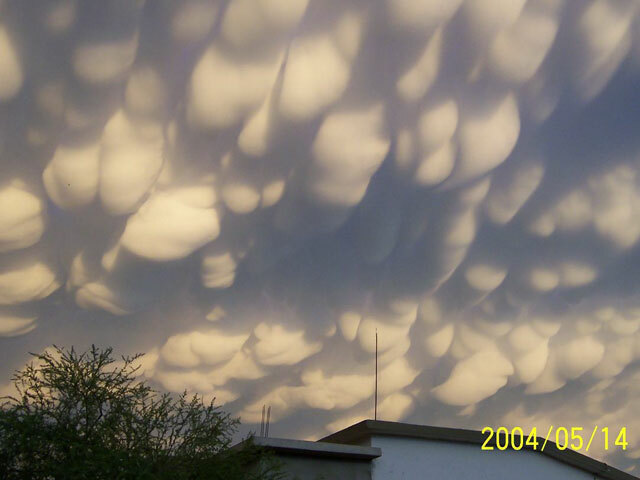 He then explains the sighting as clouds of the mammatus type, that are like dull grey spheres, tight together, rolling through the sky in parallel strokes or bands formation. He acknowledges that the "T" shape seems odd but suggests that perhaps one should not rely too heavily on the drawings because the investigator who drew them is a "believer" in alien visitors. He adds that the description given by the witness is less categorical than the drawing as he is not sure how many rows constituted the crossbar since he said "at least three", and does not recall precisely how many bands were trailing behind, saying they were "several". He adds that the account was recorded nearly 8 years after the sighting and thus it cannot be excluded that the witness "subconsciously attributed a more structured and solid appearance to the phenomenon in the course of those years." He says that the fact that the sighting lasted only 2 or 3 seconds before the witness was "blinded" [in quotes] is important too the explanation by mammatus clouds. He proposes that the witness was blinded by the rising sun piercing through the clouds or by a lightning flash, as they are often observed when mammatus is present. He acknowledges that the witness however insists that he did not see any light nor hear any sound, so a third possibility is that the temporary blindness a physiological condition of the witness. He adds that it is "conceivable that the emotional shock" caused by the sudden confrontation with the unknown phenomenon resulted in an elevation in blood pressure causing blurred vision and spots before the eyes; which are common side effects of abrupt fluctuations in blood pressure. He says that "we know nothing" about the physical condition of the witness. 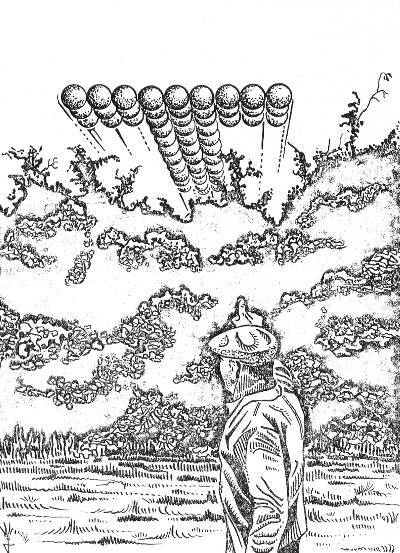 Van Utrecht explains the vertical diamond-shaped cloud as a whirlwind or tornado, with its expanding motion and sudden dissipation close to the ground, and the fact that tornados require similar weather conditions as mammatus, i.e. hot air close to the ground and significantly cooler low pressure air above. Van Utrecht says the witness claimed that he saw the black cloud in the northwest and that the spheres were traveling in a west-southwestern trajectory, but the map shows a different situation that implies that the spheres had moved more or less in the direction where the black cloud was spotted. Van Utrecht says that the biggest problem with the cloud explanation is the estimated distance of no more than 10 meters from the witness, but says it is due to the investigators who possibly did "not verify the witness' ability to accurately gauge distances." He however adds that because the small trees which were only about 15 meters from him should have made good reference points, so "it seems unlikely that an observer would describe a large cloud as a formation of spheres no bigger in size than a small van." He notes that the "rolling" motion of the sphere is typical for mammatiform clouds but "rarely" perceptible in a time frame of 2 or 3 seconds. He concludes that all the data except the estimated size and distance, point to a "a rare, miniature version" of mammatiform cloud formation as the explanation of the sighting. 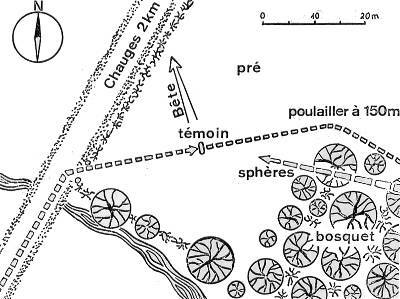 The website indicates that in October 1954 08:00 in La Feuillade, France, "About 50 .4m spheres in tight T-formation, roll to the west northwest just over woods." And: "Unusual objects were sighted, that had unconventional appearance and performance. 50 spheres, about 1 foot across, were observed in a forest for over one minute." Web site "Astronomy Picture of the Day"
[ja1] "Plein Feu Sur La Creuse - A La Mémoire de J.G. Dohmen", article by Jan D'Agure, in the ufology magazine Lumières Dans la Nuit (LDLN), France, #130, pp 15-16, December 1973. [---] "Les Soucoupes Volantes: Le Grand Refus? ", livre par le groupe d'ufologie G.A.B.R.I.E.L., Michel Moutet éditeur, France, pp. 226-231, 1978. 0.1 Patrick Gross October 14, 2007 First published.